If you haven’t been following along on my new feature account @creativelife_happylife, then you simply must!! It’s been so fun. 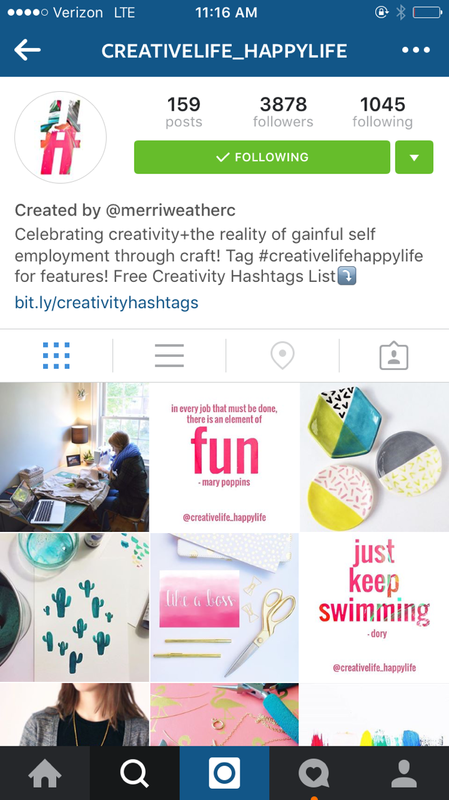 This is an Instagram account dedicated to celebrating creativity and gainful self employment through craft! If you are a maker, artist or creative, this account is for you!! Tag #creativelifehappylife for single image features on the account! All your art, craft, maker-space, supply hoard, messy desk, paint covered hands and creative pursuit photos can be tagged #creativelifehappylife! I love seeing what you are making in your studio and sharing it on the account – of course, always with your permission! What is a Maker Takeover!? On the account, there is a visual pattern in the feed. Every fourth image is text based. In between those text images are features – reposts from the #creativelifehappylife feed. A maker takeover is when three of those images between two text images are YOURS!! All three! Makers, Artists, Creatives: Get featured on Creative Life Happy Life! Want to be a featured Takeover artist?? captions must not include discount codes, giveaways, blatant promotions etc. captions should be conversational in nature (“this is my workspace, I thrifted this desk for $5 and it has been my main workstation for 4 years now….” Or “I’m currently feeling very inspired by…” Etc etc. images must be square or vertical – prefer no horizontal images please. no collage images only full photos. they can be images you already have posted. Girl, this is genius. I’m going to submit as soon as I get something good enough for this put together. This looks awesome! Love your idea for this & can’t wait to submit some pics :D Thank you for putting this together!